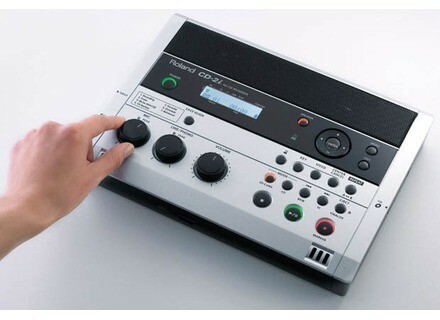 CD-2i SD/CD Recorder, Digital Multitrack Recorder/DtD from Roland. Roland announced the CD-2i SD/CD Recorder, designed to capture audio render it to CD or SD memory card for storage and distribution. The CD-2i has a number of playback features ideal for an educational setting, according to Roland. There are several playback modes available, including the ability to change the pitch, key and tempo of playback. Center cancel and metronome functions are provided, as well as reverb, and bass and treble tone control. With a built-in CD drive, the CD-2i can instantly burn CDs for distribution, whether it’s for band practice or to capture a recent performance. Audio can also be saved directly to any SDHC card (up to 32 GB). The CD-2i is scheduled to ship in June with a suggested retail price of $759.00. [Musikmesse] Boss BR-800 Digital Recorder Boss introduces the new BR-800 — described as a battery-powered "studio to go". [Musikmesse] Korg MR-2 Recorder Korg has added a new handheld recorder to its MR Series of DSD digital recorders—the MR-2 High Resolution Mobile Recorder. [Musikmesse] Universal Audio 4-710D Preamp Universal Audio announced a new addition to its line of nalog recording hardware: the 4-710D Four-Channel "Twin-finity" Mic Preamp & DI with Dynamics.